Wickenburg may seem like a small, unassuming town, but it has a rich history and a strong community. If you own a home or business in Wickenburg, you have a potentially strong investment on your hands. You need respected Arizona roofing professionals to work on your property and keep it in the best shape for years to come. The roofing experts at Arizona Native Roofing can provide all your roofing needs, from new roof installation to roof repair and ongoing maintenance. 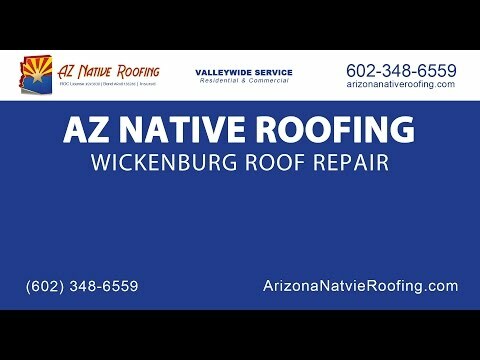 Our experienced roofers have been delivering high-quality workmanship to the citizens of Wickenburg for years, and we have a reputation for success in the community. Our roofers specialize in all types of roofing, including popular shingle and tile roofing. Our team has been installing and repairing roofs for many years, so they have the expertise to offer guidance on the best type of roof for your property, to troubleshoot issues, and to make seamless repairs. Whether you need simple roof maintenance or you have an emergency roof repair, our team is ready to help you. We offer flexible schedule for emergency repairs, ensuring that the issue is taken care of quickly to protect your home and your family. When you hire Arizona Native Roofing, you can rest easy knowing that you are in the hands of the experts. We have many loyal customers throughout Wickenburg, and we’d love to welcome you to our growing family. We are committed to providing the highest level of customer service, and we’re certain you will see the difference it makes in every interaction you have with our company, even when you’re just calling to get information. If your Wickenburg home is in need of quality roofing services, our experienced team of roofers can help.Call Arizona Native Roofing today to schedule a consultation for your new roof project or to get an inspection for needed roof repairs. We have multiple references available upon request.